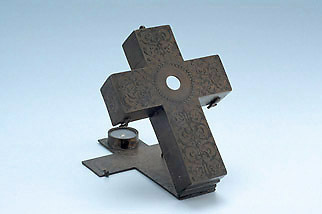 A crucifix dial is a particular form of polyhedral dial. This example is extensively inscribed and decorated; on one side of the cross is a foliage decoration with the inscription 'LAVREA CHRISTO'. On the arms of the cross are engraved the inscriptions 'HIC DABIT HORAM CLARVS APOLLO' ('here the bright Apollo gives the hours') and 'NVBE FVGATA SPLENDEAT AETHER' ('the clouds gone, the air shines'). The other face of the cross is decorated with arabesques and has at the centre an equinoctial dial, whose gnomon is missing, and foliate decoration.